Owning a business or even working in one, often requires a degree of creative thinking and brainstorming new ideas or solutions is a vital part of pushing forward in business. Our brains tend to get used to routine fairly quickly and unfortunately routine tends to stifle creativity, which means we then have less of those ‘breakthrough moments’. Trying to engage the right side of our brains to help us solve problems and come up with new ideas can be massively beneficial, but how can we make sure we’re really nurturing our creativity in order to do this? 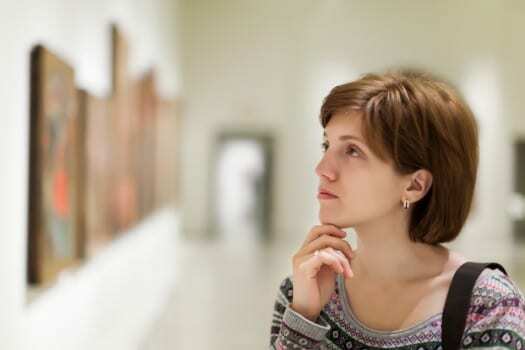 Wandering around an art gallery, museum or exhibition can really get the creative juices flowing. The arts are known to be a stimulus for creativity and it’s often not something we find to be a part of everyday life. For many of us living in cities, there are countless resources at our fingertips to help us connect to the arts. Lunchtime performances, free art exhibitions and free entry to museums and galleries. Instead of spending another lunchtime staring at a scrolling twitter feed, get out and have a wander around your local gallery. A change of scenery can do the world of good when it comes to brainstorming new ideas. I often pitch up at my local coffee shop with my laptop for a couple of hours or go out walking when I need to really think on something important. New experiences or environments stimulate the brain and help us break routine habits and routine thinking. Sometimes it could be as simple as taking a notepad to a park bench and seeing what comes up. There is a wealth of events out there to take advantage of. I’ve been to business book clubs, interesting seminars, women only networking events and talks on a variety of relevant subjects. Most of these are either free or very affordable. Some of the information I may already know but it could remind me of a great marketing idea or a new way to utilize social media, for example. Talk to friends, colleagues or family about a work problem you might have. A fresh perspective can be helpful but also sometimes just talking through the issue aloud can help you come up with solutions yourself. Mindfulness takes our brains out of autopilot mode and brings them into the present moment to experience what is going on in the here and now. This gives our mind a greater sense of clarity and the freedom to think about what we are doing and how we are feeling right now rather than examining the past or worrying about the future, both futile states of mind. Mindfulness is often said to unlock creative potential and increase productivity. This is again something that links to routine and the brain’s response to this. Taking yourself out of the everyday routine and pushing yourself to try something new can be a huge boost to creative thinking. Immersing your brain into a new activity also gives it a rest from thinking about business and work and can then allow a new perspective when you go back to the project you were working on. Learning a new language, taking a new exercise class, travelling to a new location or even something as simple as taking a new route to work can have an effect. How important is high-speed broadband for your business?